Ghashghaee, M., Shirvani, S., Farzaneh, V. (2018). Hydroconversion of Furfural over Cu-Cr/SiO2 Nanocatalysts: A Comparative Study. Iranian Journal of Chemical Engineering(IJChE), 15(2), 38-51. M. Ghashghaee; S. Shirvani; V. Farzaneh. "Hydroconversion of Furfural over Cu-Cr/SiO2 Nanocatalysts: A Comparative Study". 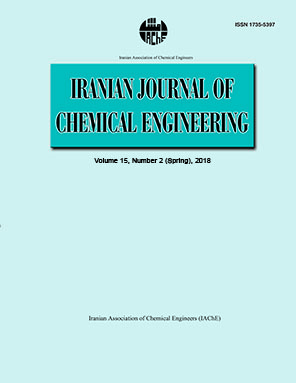 Iranian Journal of Chemical Engineering(IJChE), 15, 2, 2018, 38-51. Ghashghaee, M., Shirvani, S., Farzaneh, V. (2018). 'Hydroconversion of Furfural over Cu-Cr/SiO2 Nanocatalysts: A Comparative Study', Iranian Journal of Chemical Engineering(IJChE), 15(2), pp. 38-51. Ghashghaee, M., Shirvani, S., Farzaneh, V. Hydroconversion of Furfural over Cu-Cr/SiO2 Nanocatalysts: A Comparative Study. Iranian Journal of Chemical Engineering(IJChE), 2018; 15(2): 38-51. Furfural is one of the most promising chemical platforms with bright perspective with respect to the production of biobased chemicals and fuels from lignocellulosic material. Globally, the majority of this biomass derived chemical is converted into furfuryl alcohol, a building block in polymers industry. The vapor-phase hydrogenation of furfural over copper species dispersed on two types of silica (bulk-type and nano-sized) supports with or without chromium as a promoter was studied for the first time. The catalysts were synthesized via impregnation method and operated under mild hydrogenation reaction conditions. The results represented that the catalytic performance of the nano-sized silica-supported catalyst was better in terms of furfural conversion, furfuryl alcohol yield and selectivity than that of the bulk-type silica after 4 hours of operation. However, by incorporation of chromium as a promoter, the bulk-type silica-supported catalyst exhibited an improved performance during the whole run length (higher than 82% and 96% of furfural conversion and furfuryl alcohol selectivity, respectively). Mariscal, R., Maireles-Torres, P., Ojeda, M., Sadaba, I. and Lopez Granados, M., “Furfural: A renewable and versatile platform molecule for the synthesis of chemicals and fuels”, Energ. Environ. Sci., 9(4), 1144 (2016). Lange, J.-P., van der Heide, E., van Buijtenen, J. and Price, R., “Furfural: A promising platform for lignocellulosic biofuels”, Chem. Sus. Chem., 5(1), 150 (2012). Sun, D., Studies on conversion of biomass-based materials into value-added chemicals, Graduate School of Engineering, Chiba University, (2014). Dusselier, M., Mascal, M. and Sels, B., Top chemical opportunities from carbohydrate biomass: A chemist’s view of the biorefinery, In: Nicholas, K. M. (Ed.) Selective catalysis for renewable feedstocks and chemicals, Springer International Publishing, (2014). Climent, M. J., Corma, A. and Iborra, S., “Conversion of biomass platform molecules into fuel additives and liquid hydrocarbon fuels”, Green Chem., 16(2), 516 (2014). Nakagawa, Y., Tamura, M. and Tomishige, K., “Catalytic reduction of biomass-derived furanic compounds with hydrogen”, ACS Catal., 3(12), 2655 (2013). Wettstein, S. G., Alonso, D. M., Gürbüz, E. I. and Dumesic, J. A., “A roadmap for conversion of lignocellulosic biomass to chemicals and fuels”, Curr. Opin. Chem. Eng., 1(3), 218 (2012). Dutta, S., De, S., Saha, B. and Alam, M. I., “Advances in conversion of hemicellulosic biomass to furfural and upgrading to biofuels”, Catal. Sci. Technol., 2(10), 2025 (2012). Corma, A., Iborra, S. and Velty, A., “Chemical routes for the transformation of biomass into chemicals”, Chem. Rev., 107(6), 2411 (2007). McMillan, J. D., Biotechnological routes to biomass conversion, DOE/NASULGC Biomass & Solar Energy Workshops, National Bioenergy Center, National Renewable Energy Laboratory, (2004). Wu, J., Shena, Y., Liu, C., Wang, H., Geng, C. and Zhang, Z., “Vapor phase hydrogenation of furfural to furfuryl alcohol over environmentally friendly Cu–Ca/SiO2 catalyst”, Catal. Commun., 6(9), 633 (2005). Yan, K., Wu, G., Lafleur, T. and Jarvis, C., “Production, properties and catalytic hydrogenation of furfural to fuel additives and value-added chemicals”, Renew. Sust. Energ. Rev., 38, 663 (2014). Hoydonckx, H. E., Van Rhijn, W. M., Van Rhijn, W., De Vos, D. E. and Jacobs, P. A., Furfural and derivatives, In: Ullmann's encyclopedia of industrial chemistry, Wiley Online Library, (2007). Li, X., Jia, P. and Wang, T., “Furfural: A promising platform compound for sustainable production of C4 and C5 chemicals”, ACS Catal., 7621 (2016). Nagaraja, B. M., Padmasri, A. H., David Raju, B. and Rama Rao, K. S., “Vapor phase selective hydrogenation of furfural to furfuryl alcohol over Cu–MgO coprecipitated catalysts”, J. Mol. Catal. A, 265(1–2), 90 (2007). O'Driscoll, Á., Curtin, T., Hernandez, W. Y., Van Der Voort, P. and Leahy, J. J., “Hydrogenation of furfural with a Pt–Sn catalyst: The suitability to sustainable industrial application”, Org. Process Res. Dev., 20(11), 1917 (2016). Vetere, V., Merlo, A. B., Ruggera, J. F. and Casella, M. L., “Transition metal-based bimetallic catalysts for the chemoselective hydrogenation of furfuraldehyde”, J. Braz. Chem. Soc., 21(5), 914 (2010). Nagaraja, B. M., Aytam, H. P., Podila, S., Reddy, K. H. P., Raju, B. D. and Kamaraju, S. R. R., “A highly active Cu-MgO-Cr2O3 catalyst for simultaneous synthesis of furfuryl alcohol and cyclohexanone by a novel coupling route-Combination of furfural hydrogenation and cyclohexanol dehydrogenation”, J. Mol. Catal. A, 278(1–2), 29 (2007). Ghashghaee, M., Shirvani, S. and Ghambarian, M., “Kinetic models for hydroconversion of furfural over the ecofriendly Cu-MgO catalyst: An experimental and theoretical study”, Appl. Catal. A-Gen., 545, 134 (2017). Gao, X., Yu, X., Tao, R. and Peng, L., “Enhanced conversion of furfuryl alcohol to alkyl levulinates catalyzed by synergy of CrCl3 and H3PO4”, BioRes., 12(4), 7642 (2017). Shirvani, S. and Ghashghaee, M., “Mechanism discrimination for bimolecular reactions: Revisited with a practical hydrogenation case study”, Phys. Chem. Res., 5(4), 727 (2017). Rao, R. S., Baker, R. T. K. and Vannice, M. A., “Furfural hydrogenation over carbon-supported copper”, Catal. Lett., 60(1–2), 51 (1999). Nagaraja, B. M., Kumar, V. S., Shasikala, V., Padmasri, A. H., Sreedhar, B., Raju, B. D. and Rao, K. S., “A highly efficient Cu/MgO catalyst for vapour phase hydrogenation of furfural to furfuryl alcohol”, Catal. Commun., 4(6), 287 (2003). Reddy, B. M., Reddy, G. K., Rao, K. N., Khan, A. and Ganesh, I., “Silica supported transition metal-based bimetallic catalysts for vapour phase selective hydrogenation of furfuraldehyde”, J. Mol. Catal. A-Chem., 265(1–2), 276 (2007). Shirvani, S., Ghashghaee, M., Farzaneh, V. and Sadjadi, S., “Influence of catalyst additives on vapor-phase hydrogenation of furfural to furfuryl alcohol on impregnated copper/magnesia”, Biomass Conv. Bioref., 8 (1), 79 (2017). Liu, H., Hu, Q., Fan, G., Yang, L. and Li, F., “Surface synergistic effect in well-dispersed Cu/MgO catalysts for highly efficient vapor-phase hydrogenation of carbonyl compounds”, Catal. Sci. Technol., 5(8), 3960 (2015). Baijun, L., Lianhai, L. and Tianxi, C., “Study on selective hydrogenation of furfural to furfuryl alcohol over heteropolyacid modified Raney nickel”, Chinese J. Catal., 3, (1997). Baijun, L., Lianhai, L., Bingchun, W., Tianxi, C. and Iwatani, K., “Liquid phase selective hydrogenation of furfural on Raney nickel modified by impregnation of salts of heteropolyacids”, Appl. Catal. A-Gen., 171(1), 117 (1998). Lee, S.-P. and Chen, Y.-W., “Selective hydrogenation of furfural on Ni−P, Ni−B, and Ni−P−B ultrafine materials”, Ind. Eng. Chem. Res., 38(7), 2548 (1999). Lee, S.-P. and Chen, Y.-W., “Selective hydrogenation of furfural on Ni-P-B nanometals”, Stud. Surf. Sci. Catal., 130, 3483 (2000). Farzaneh, V., Shirvani, S., Sadjadi, S. and Ghashghaee, M., “Promoting effects of calcium on the performance of Cu-MgO catalyst in hydrogenation of furfuraldehyde”, Iran. J. Catal., 7(1), 53 (2017). Ghashghaee, M., Sadjadi, S., Shirvani, S. and Farzaneh, V., “A novel consecutive approach for the preparation of Cu–MgO catalysts with high activity for hydrogenation of furfural to furfuryl alcohol”, Catal. Lett., 147(2), 318 (2017). Sadjadi, S., Farzaneh, V., Shirvani, S. and Ghashghaee, M., “Preparation of Cu-MgO catalysts with different copper precursors and precipitating agents for the vapor-phase hydrogenation of furfural”, Korean J. Chem. Eng., 34(3), 692 (2017). Jiménez-Gómez, C. P., Cecilia, J. A., Durán-Martín, D., Moreno-Tost, R., Santamaría-González, J., Mérida-Robles, J., Mariscal, R. and Maireles-Torres, P., “Gas-phase hydrogenation of furfural to furfuryl alcohol over Cu/ZnO catalysts”, J. Catal., 336, 107 (2016). Li, F., Cao, B., Ma, R., Liang, J., Song, H. and Song, H., “Performance of Cu/TiO2-SiO2 catalysts in hydrogenation of furfural to furfuryl alcohol”, Can. J. Chem. Eng., 94(7), 1368 (2016). Ghashghaee, M., Shirvani, S. and Farzaneh, V., “Effect of promoter on selective hydrogenation of furfural over Cu-Cr/TiO2 catalyst”, Russ. J. Appl. Chem., 90(2), 304 (2017). Wang, Y., Zhou, M., Wang, T. and Xiao, G., “Conversion of furfural to cyclopentanol on Cu/Zn/Al catalysts derived from hydrotalcite-like materials”, Catal. Lett., 145(8), 1557 (2015). Tukacs, J. M., Bohus, M., Dibo, G. and Mika, L. T., “Ruthenium-catalyzed solvent-free conversion of furfural to furfuryl alcohol”, RSC Adv., 7(6), 3331 (2017). Wang, M., Zhang, X., Chen, Z., Tang, Y. and Lei, M., “A theoretical study on the mechanisms of intermolecular hydroacylation of aldehyde catalyzed by neutral and cationic rhodium complexes”, Sci. China Chem., 57(9), 1264 (2014). Vargas-Hernández, D., Rubio-Caballero, J. M., Santamaría-González, J., Moreno-Tost, R., Mérida-Robles, J. M., Pérez-Cruz, M. A., Jiménez-López, A., Hernández-Huesca, R. and Maireles-Torres, P., “Furfuryl alcohol from furfural hydrogenation over copper supported on SBA-15 silica catalysts”, J. Mol. Catal. A-Chem., 383–384, 106 (2014). Sitthisa, S., Sooknoi, T., Ma, Y., Balbuena, P. B. and Resasco, D. E., “Kinetics and mechanism of hydrogenation of furfural on Cu/SiO2 catalysts”, J. Catal., 277(1), 1 (2011). Villaverde, M. M., Bertero, N. M., Garetto, T. F. and Marchi, A. J., “Selective liquid-phase hydrogenation of furfural to furfuryl alcohol over Cu-based catalysts”, Catal. Today, 213, 87 (2013). Aissi, C. F., Daage, M., Wrobel, G., Guelton, M. and Bonnelle, J. P., “Reactive hydrogen species in the copper-chromium oxide system”, Appl. Catal., 3(2), 187 (1982). Wang, S.-R., Yin, Q.-Q. and Li, X.-B., “Catalytic performance and texture of TEOS based Cu/SiO2 catalysts for hydrogenation of dimethyl oxalate to ethylene glycol”, Chem. Res. Chin. Univ., 28, 119 (2012). Thommes, M., Kaneko, K., Neimark Alexander, V., Olivier James, P., Rodriguez-Reinoso, F., Rouquerol, J. and Sing Kenneth, S. W., “Physisorption of gases, with special reference to the evaluation of surface area and pore size distribution (IUPAC Technical Report)”, Pure Appl. Chem., 87(9-10), 1051 (2015). He, Z., Lin, H., He, P. and Yuan, Y., “Effect of boric oxide doping on the stability and activity of a Cu–SiO2 catalyst for vapor-phase hydrogenation of dimethyl oxalate to ethylene glycol”, J. Catal., 277(1), 54 (2011).